""Let us fulfil Mahatma Gandhi`s vision of Clean India – Swachh Bharat""
""PM: "Swachh Bharat Abhiyaan" should be approached with a bipartisan spirit of patriotism""
""PM invites nine public figures to contribute to Swachh Bharat and share their experience on social media""
""Film Actor Aamir Khan joins Prime Minister on stage as PM administers pledge to people at Rajpath""
"PM also makes surprise visit to Mandir Marg Police Station"
"PM initiates cleanliness drive at Valmiki Basti"
"''हम सब महात्मा गांधी के स्वच्छ भारत के सपने को पूरा करें''"
"प्रधानमंत्री ने कहा, ''स्वच्छ भारत अभियान को देशभक्ति की भावना से जोड़कर देखा जाना चाहिए’’"
"स्वच्छ भारत अभियान में योगदान देने और सोशल मीडिया पर अपना अनुभव साझा करने के लिए प्रधानमंत्री ने 9 प्रमुख हस्तियों को आमंत्रित किया"
"प्रधानमंत्री द्वारा राजपथ पर स्वच्छता की शपथ दिलाए जाने के दौरान फिल्म अभिनेता आमिर खान ने मंच साझा किया"
"प्रधानमंत्री ने मंदिर मार्ग पुलिस स्टेशन का किया औचक निरीक्षण "
"प्रधानमंत्री ने वाल्‍मीकि बस्ती से स्वच्छ भारत अभियान की शुरुआत की"
The Prime Minister, Shri Narendra Modi, today exhorted people to fulfil Mahatma Gandhi`s vision of Clean India. Launching the Swachh Bharat Abhiyaan at Rajpath in New Delhi, the Prime Minister paid homage to two great sons of Mother India, Mahatma Gandhi and former Prime Minister Lal Bahadur Shastri, on their birth anniversary. He recalled how the nation`s farmers had responded to Shri Shastri`s call of "Jai Jawan, Jai Kisan," and made India self-sufficient in food security. He said that out of Gandhiji`s two dreams – Quit India, and Clean India, the people had helped to ensure that the first became a reality. However, the second dream – Clean India – still remained unfulfilled. 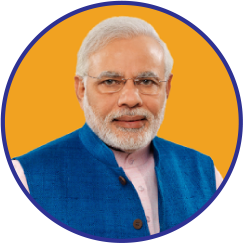 The Prime Minister said it was our social responsibility as citizens of India to help fulfil Gandhiji`s vision of Clean India, by his 150th birth anniversary in 2019.The Prime Minister, Shri Narendra Modi, today exhorted people to fulfil Mahatma Gandhi`s vision of Clean India. Launching the Swachh Bharat Abhiyaan at Rajpath in New Delhi, the Prime Minister paid homage to two great sons of Mother India, Mahatma Gandhi and former Prime Minister Lal Bahadur Shastri, on their birth anniversary. He recalled how the nation`s farmers had responded to Shri Shastri`s call of "Jai Jawan, Jai Kisan," and made India self-sufficient in food security. He said that out of Gandhiji`s two dreams – Quit India, and Clean India, the people had helped to ensure that the first became a reality. However, the second dream – Clean India – still remained unfulfilled. The Prime Minister said it was our social responsibility as citizens of India to help fulfil Gandhiji`s vision of Clean India, by his 150th birth anniversary in 2019. The Prime Minister applauded and appreciated the work done by all previous Governments and social, religious and cultural organizations towards cleanliness. He repeatedly emphasized that the work of cleaning India cannot be done by one person, or by Government functionaries alone – it has to be done by 125 crore people, who are sons and daughters of Mother India. He said the work of Swachh Bharat should become a mass movement, and people should neither litter, nor let others litter (na gandagi karenge, na karne denge). The Prime Minister said that according to the World Health Organization, an average of Rs. 6500 per person was lost in India due to lack of cleanliness and hygiene. He said Swachh Bharat would therefore make a significant impact on public health, and in safeguarding income of the poor, ultimately contributing to the national economy. He exhorted people to devote 100 hours every year towards the cause of cleanliness. The Prime Minister also emphasized the importance of building toilets. He said sanitation should not be seen as a political tool, but should only be connected to patriotism (rashtrabhakti) and commitment to public health. 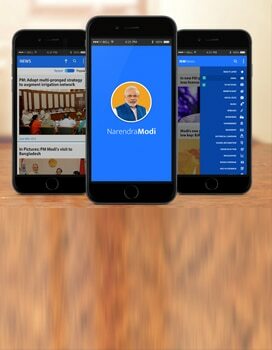 The Prime Minister said he had invited nine public figures: Mridula Sinha, Sachin Tendulkar, Baba Ramdev, Shashi Tharoor, Anil Ambani, Kamal Hasan, Salman Khan, Priyanka Chopra and Team Tarak Mehta ka Oolta Chashma – to make a contribution towards Swachh Bharat, share the same on social media, and invite nine other people to do the same, hence forming a chain. He urged people to share their contributions on social media using the hash-tag #MyCleanIndia. The Prime Minister congratulated the winners of the crowdsourcing contests for logo and tagline of the Swachh Bharat Abhiyaan – Anant from Maharashtra and Bhagyashree from Gujarat. The tag-line is "Ek Kadam Swachhta Ki Ore" The Prime Minister was joined by noted film actor Aamir Khan on stage, as he administered the Swachhta Shapath (Cleanliness Pledge) to the large assembled gathering. Union Ministers Venkaiah Naidu and Nitin Gadkari also addressed the gathering. Earlier, the Prime Minister visited Rajghat and Vijay Ghat to offer floral tributes to two great sons of India, Mahatma Gandhi and Lal Bahadur Shastri, on their birth anniversary. He later visited the Valmiki Basti, where Gandhiji had once stayed, and initiated a cleanliness drive there. The Prime Minister also paid a surprise visit to the Mandir Marg police station in New Delhi. He himself picked up a broom to clean dirt. He later exhorted police officials to maintain cleanliness. •The spirit of Swachh Bharat reverberated through the city of Delhi today. •The Prime Minister was welcomed by five thousand children with loud cheer. Children were enthusiastically waving flags and placards in support of cleanliness drive. •Film on Swachhta Mission was watched with rapt attention by everyone present. •Before administrating the oath, renowned actor and social activists, Shri Aamir Khan was called on the stage and then the pledge was administrated by the Prime Minister. The Prime Minister asked everyone to raise their hands and think of Mahatma Gandhi while taking the oath. •To the utter delight of the children the Prime Minister started walked with them for some distance, despite being on fast, after flagging off the Walkathon. •People from all walks from life gathered at Rajpath on the occasion. •At Valmiki Basti, the Prime Minister exhorted children to become "Swachhta Senanis"
Following is the English rendering of the text of Prime Minister, Shri Narendra Modi at the launch of Swachhata Mission, here today. “Bharat Mata ki Jai, Long Live Mahatma Gandhi, Long Live Lal Bahadur Shastri. My Colleagues from Central Government, Shri Venkaiah Naidu ji and Shri Nitin Gadkari ji, dignitaries and my young friends. Today is 2nd October, birth anniversaries of our Pujya Mahatma Gandhi and Lal Bahadur Shashtri ji. Lal Bahadur Shastri gave us the Mantra of Jai Jawan Jai Kisan. Indian Farmers filled the granaries in reply to that exhortation. Pujya Bapu gave us the message of ‘Quit India- Clean India’. Our countrymen, under the leadership of Mahatma Gandhi, freed the nation from colonialism. Bapu’s dream of cleanliness, however, remains unfulfilled. Here, we had called for a logo and an idea through crowd-sourcing, asked the people for a tagline. Bhai Anant of Maharashtra and sister Bhagyashri won the contest. It was right to the point. I can see, that through these glasses Gandhiji is looking and asking whether we have cleaned India or not. This is not just a logo. Through these glasses he is looking, asking- what have you done? What will you do and how? By when will you do it? This is the message of the logo that has Mahatma Gandhi’s glasses. They give us the message of Clean India. I compliment the creator of this logo- Shri Anant. One tag line has been given by Bhagyashri- ‘one step towards cleanliness’. Not a big deal, just a step. For this I complement Bhagyashri. Today from this platform with all the authenticity, and purity at my command, India Gate is right in front of me where flame of our martyrs is burning, I swear by that, I am not making a political statement. All Governments of this country must have done their bit for this cause. Many social, cultural and religious leaders must have contributed towards this task. There may have been different people, different forms of programme, I salute all of them. I have to take this series forward. I don’t make any claim that the new Government is doing everything. I acknowledged all previous Governments from the Red Fort also. Today, from this august platform I convey my respect to all Governments whether of Centre or of State, municipal bodies, social organizations, Sarvodaya leaders, Seva Dal workers. As this holy mission is starting today, I salute every one of them and pray to all countrymen to start this programme. Sometimes I feel that the job of getting rid of filth belongs to Safai karmchari only? Isn’t it the duty of all the 125 crore countrymen? Will we keep on imposing everything on them only? Something good happens or bad, will be keep on blaming them only? We have to change this situation. Like all 125 crore Indians the Prime Minister is also first son of Bharat Mata and Prime Minister later. Therefore, as the children of this mother, all of us are responsible that we should not keep our country like this. It may be village neighborhood, home family, school and college, Mandir, Masjid or Gurudwara; how can we keep it dirty? Wherever we see filth or see someone throwing papers why don’t we feel like picking that up? I know this will not be accomplished only by publicity campaign. Old habits take time to change. It’s a difficult task, I know. But we have till 2019 when we will observe 150th anniversary of Mahatma Gandhi. I am grateful to my media friends who are spreading this message. If we collectively make it a people’s movement then I don’t see any reason why we will not be counted among the clean cities and nations of the world. India can also do it, Indians can do it. If Indians can reach Mars with minimum expense then can’t they clean their neighborhood? No Prime Minister or Minister took us to Mars. It was done by the scientists; children of Mother India. Cleanliness will also be achieved together. I know, in coming days I will be criticized. Look what has been achieved? I understand lot of criticism will come my way. However, I am ready to face all the criticism for making Mother India pristine once again. I have come with the determination that 125 crore Indians will not let Mother India remain dirty. We will not leave any stone unturned to fulfill Bapu’s dreams. I have decided to start a movement in social media also. It is there on MyGov.in website also. A new website has been created on ‘Clean India’. Work has been started on Facebook and Twitter also. #MycleanIndia was started today. I appeal all the countrymen to upload photographs of garbage, then clean that and upload the video and the photographs of the cleaned place. I also appeal to media. There are many youngsters, organizations in every nook and corner of the country. They are doing the work of cleanliness way before I became the Prime Minister. They should be brought to the limelight by Media. All common people who work for cleanliness should be highlighted. All of us should create an inspiring environment. Finger pointing will not help as I told earlier this is beyond politics. This is a work solely inspired by patriotism. We will do it with patriotic feeling. There is no place for politics. That is why I say there are many organizations and social and cultural bodies those who are working in their own way. I have seen many villages where Sarpanch is so alert and villagers keep the village in exemplary cleanliness. Many people are like that. Some of the teachers take lot of interest in keeping the premises clean, the atmosphere is kept very pure. When we come to India Gate and go towards Rashtrapati Bhawan it feels nice to see the clean surroundings. Should not every corner of India be this clean? Isn’t this our social duty? We will do a great disservice by treating it politically or considering it a photo opportunity. Mahatma Gandhi did not go to every locality to clean up but his commitment created awareness towards cleanliness in entire India. We also have to do it together. Wherever we are, we should do it. I believe we will be able to clean our Mother India. This is a work for 125 crore Indians. In those 125 crore Indians there is a person called Modi. Not that Modi is alone but there are 125 crore Indians and I am saying it 125 crore times. This work is not only for Government or for Ministers, neither is this work only of social organizations and devoted social workers. This is a mass movement. The more we associate this with common person, the more are the chances of success. Today Navarati is coming to an end. Tomorrow we will celebrate Vijayadashmi. I convey my best wishes to all countrymen for Vijayadashmi tomorrow. Today, I have started a programme on social media. I have invited 9 people to come to public place and work for cleanliness. I am sure that those 9 people whom I have invited will surely do this work. Not only this, I have requested them that they should also invite 9 other people. Then 9 more. I request you also that you also upload videos of your cleanliness projects and this chain of 9 should carry on. Today, I have invited Goa Governor Hon’ble Mridula Sinha, Bharat Ratna Sachin Tendulkar, Yoga Guru Baba Ramdev, Congress leader Shri Shashi Tharoor jee, Shriman Kamal Hasan, Shriman Salman Khan, sister Priyanka Chopra and the entire team of Tarak Mehta ka Ulta Chashma. I have told them to push this through their and other serials. Our film industry will also see, in last fifty years there have been many movies where they were episodes related to cleanliness. We need to encourage this and do our duty. Brothers and sisters there is a startling evaluation of WHO – they say that the diseases created by lack of cleanliness results in additional loss of 6500 rupees to every Indian. Due to illness someone is not able to drive taxi or auto rickshaw or not able to distribute newspapers or not able to deliver milk. This is just the average of the total loss. If we take out affluent households then burden on poor people will go up to 12-15 thousand. If we just spread cleanliness, our poor will be saved 6500 rupees. This will save him from diseases and unemployment. This movement is very important for the health of the poor. Serving Mother India is serving the poorest. Come let’s see on MyGov.in, my Facebook or twitter, the mood that I am witnessing, the enthusiasm that I see, fills me with hope that public is ready to move hundred steps ahead of the Government. If public is moving there is no reason to stop them. Brothers and sisters, We should gift something to Mahatma Gandhi. In 2019 when Gandhiji will turn 150, we should gift him a Swachh Bharat created with a collective responsibility. Quit India was successful due to the involvement of everyone in the freedom struggle. Success of clean India lies in the involvement of 125 crore Indians. Jai Jawan, Jai Kisan was successful as it was given by Lal Bahadur Shastri. He called for agricultural production. Nobody asked Lal Bahadur Shastri that, are you going to the fields to plough them, have you done some farming or produced some foodgrain? Nobody asked anything. But as Lal Bahadur Shastri said Jai Kisan- all the farmers stood up and filled the granaries. The momentous tasks of giving food to every poor in India was done on the words of this great man. Now, this is the time to realise Mahatma Gandhi’s words. Just look at the purity of this great man’s words, its power, its dedication: Shouldn’t this inspire us? Whether it is me or you, success of clean India will give us the same pleasure as the success of Quit India slogan. It will give us similar joy and prosperity. We have started moving ahead with our faith in the words of these great men. Don’t put your trust on me or my Government, trust Mahatma Gandhi. Trust his sacrifice, determination and dedication. Believe in his dream of Swachh Bharat. Today this is our responsibility that if we are the children of Mother India we should not either cause filth or allow other to do it. Often when we go to foreign countries, we say how clean it was there, there was no dirt anywhere. Then I ask these people, did you like the fact that it was so clean? Then I ask, did you see anyone littering or spitting? They say, no we didn’t. Then I say that the secret of cleanliness is in the discipline of their citizens. If we manage that, I am sure we will do wonders. One more work is there – that of building toilets. In our villages more than sixty percent people are still going to toilet in open. I feel most pained that even our mothers and sisters have to go in open. We have to remove this blot. I have told corporate social responsibility people to prioritize this. We should do this much at least for the dignity of our mothers and sisters. Even today, there are many schools which don’t have separate toilets for girls. We need to change this. It is nobody’s fault; we just need to move ahead with a positive outlook of future. There should not be any political comment by any member of this movement as everybody has work. Every one before us also worked. Under Mahatma Gandhi, Congress was at the forefront of it. I worship this work, that is why I request specially to media and countrymen with folded hands that, associate this movement only with love for the country. Link this movement only with the worship of Mother India and with the poor and health of the poor. We should not vitiate the environment by talking about, who is doing who is not, who was successful, who was not. We should move with a sense of collective responsibility. With collective responsibility we will surely be successful. Now I invite every one of you. We are going to take an oath here. My request is that those who are sitting should take oath sitting, no need to stand up. Those who are standing should keep on standing. My second request is that you should raise both of your hands and remember Mahatma Gandhi. Feel that this work is for building a Bharat of the dreams of Pujya Bapu. We should not just utter the words but take solemn pledge. You will take the pledge, take the movement forward and will leave no stone unturned. I take this pledge that I will remain committed towards cleanliness and devote time for this. I will devote 100 hours per year that is two hours per week to voluntary work for cleanliness. I will neither litter nor let others litter. I will initiate the quest for cleanliness with myself, my family, my locality, my village and my work place. I believe that the countries of the world that appear clean are so because their citizens don’t indulge in littering nor do they allow it to happen. With this firms belief, I will propagate the message of Swachh Bharat Mission in villages and towns.